INTERNATIONAL CAMPAIGN AGAINST MICROPLASTIC INGREDIENTS IN COSMETICS - Supported by 100 NGOs from 42 countries and regions. Already 448 brands from 119 different manufacturers promised to remove plastic microbeads from their products. Tiny particles of plastic have been added to thousands of personal care cosmetic products sold around the world. These microbeadsplastics, hardly visible to the naked eye, flow straight from the bathroom drain into the sewer system. Wastewater treatment plants are not designed to filter them out microbeads and that is the main reason why they contribute to the Plastic Soup swirling around the world’s oceans. Sea animals absorb or eat microplasticsbeads. These microbeads are passed along the marine food chain. Since humans are ultimately at the top of this food chain, it is likely that we are also ingest them. absorbing microbeads from the food we eat. 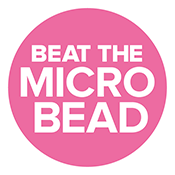 Microplasticsbeads are not biodegradable and once they enter the marine environment, they are impossible to remove.